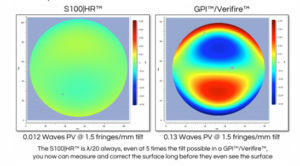 Retrace error is rarely specified for an interferometer, often ignored and can cause good parts to fail. Knowing how to minimize, decreases scrap, saves time, and lowers manufacturing cost. Recently an ÄPRE upgrade customer using a 6X zoom interferometer noticed unexplained user-to-user variations. 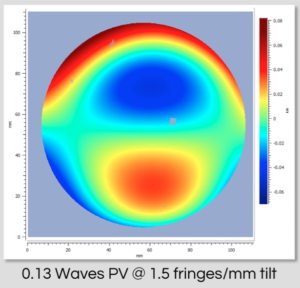 The setup was a window within a Transmission Flat (TF)/Reference Flat (RF) cavity. With the window in place, the operator adjusted the tilt fringes using the reference flat to a user selected number of tilt fringes. User-1 observed variations up to 0.04 fr. User-2 observed variations up to 0.50 fr, on the same parts! User-2 was scraping good parts with a 0.1 fr specification! Investigation revealed the root cause of the variation. User-1 adjusted to <3 tilt fringes to near null. User-2 adjusted to 7 to 10 tilt fringes. 7 to 10 fringes was enough to introduce measureable retrace error to cause the variation and falsely failed parts. 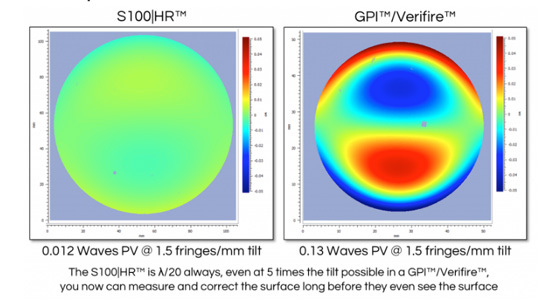 Retrace error is not controlled in 6X zoom interferometers, such as a Zygo® Mark™, GPI™, Verifire™ or Phase Shift miniFIZ interferometers. Consequently tilt fringes degrade results. Strangely even most high-end interferometers today do not specify retrace error. Why not? Retrace error is important to everyday measurements. The presence of tilt fringes in a classical zoom system will degrade any measurement, even spheres and flats. Only the ÄPRE S-Series minimizes retrace error. An ÄPRE S-Series interferometer, exhibits <λ/20 Retrace Error at 500 fringes! With the S-Series retrace error induced user to user variations are nearly nonexistent.